Extra weight can reduce your cat's quality of life. This guide will help you assess your cat's weight, control their calorie intake and help them lose excess weight. Helping your cat stay healthy includes making sure they get plenty of exercise and don't overeat. You can help an obese cat lose weight, but prevention is better. Cats that have been overweight are likely to regain weight in the future. Overweight cats are usually defined as being more than 15 per cent over their ideal weight. Obese cats are more than 30 per cent over their ideal weight. You should be able to feel your cat's ribs easily when you stroke their body lightly and you should clearly see a waistline when you look at them from above. Cats under two years of age are less likely to gain weight. Between two and 10 years of age, cats use less energy so are more at risk of becoming overweight. Senior and geriatric cats - aged 12+ - tend to be underweight. Stress can be a factor in overweight cats. 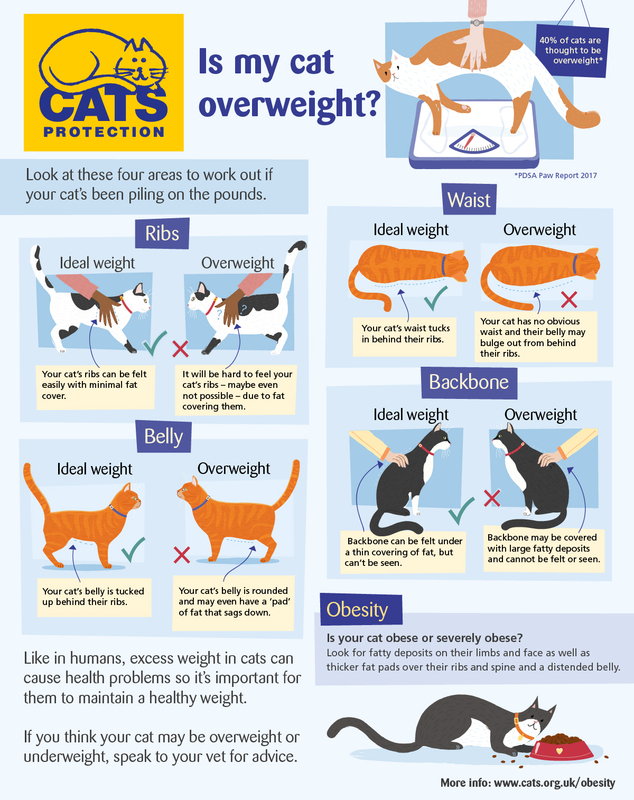 If your cat is overweight, consider their diet, lifestyle, environment and the placement of their food, water and litter tray. If your cat is overweight, ask your vet for advice on an appropriate feeding regime to ensure they get enough nutrients, without being overfed. Weighing food out daily is a helpful way to control portions. Some dry foods come with calibrated scoops, but these are easy to overfill. If you like to give your cat treats, reduce the amount of normal food you provide. Never starve overweight cats or put them on 'crash diets'. Any period of time without food can potentially be dangerous. A slow, steady weight loss is ideal. It can take as much as a year for a severely overweight cat to reach its ideal weight. It is hard to notice weight change in a cat you see every day, so regular weighing is a useful way to monitor progress. Your cat probably won't sit still on your scales, so weigh a carrying box or yourself, then weigh the cat in the box or while holding it and subtract the excess to get your cat's weight. Some vet practices offer weight clinics, where they can regularly weigh your cat using their specialist scales. Helping a cat lose weight when you have other cats - and other sources of food available - can be tricky. By feeding the overweight cat in a different room, you can give the other cats time to eat. Any uneaten food should be cleared away so the overweight cat can't steal the leftovers. Alternatively you could place food inside cardboard boxes with holes cut in the side that are too small for the overweight cat to fit inside. Your cats may need some help learning the new location of their food. Wild cats are generally solitary, so living with other cats - even siblings - may be stressful. Stress may cause cats to overeat, while other cats may lose weight when stressed. Exercise is important for maintaining a healthy weight. Indoor cats typically get less exercise and so may be more prone to obesity. Indoor cats may also suffer from stress or boredom, which can in turn cause them to overeat. Placing food inside feeding balls can encourage your cat to work for their meals. Make sure you place some of their normal ration of food inside the ball and don't inadvertently give extra food. Playing with your cat also provides exercise and a bonding opportunity.